Situation: on the lands of Kollebloem, biological farm of the village of Sint-Lievens-Esse, Herzele, in Flemish Ardennes, Belgium. Materials : waste of branches of « Arpia 2010 », branches of willow trees, stems of hazels, breaking of bricks coming from lands of Kollebloem and Arpia, piles to châtaigner, sleepers of railway, iron thread burn. 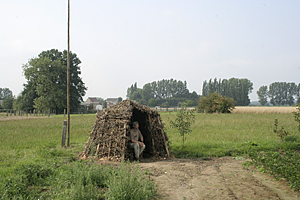 Device : four coeducational shelters on a scoop of course in the campaign of Flemish Ardennes, in the vicinity of the site of Arpia, with four benches to sit down in shelters, a progressive ‘végétalisation’ of shelters from the autumn, 2011, a maintenance of shelters by supplementary provisions of branches of walls and size of vegetation in the fur and measure of growth. Size : variable, about 2,50 m x 2,50 m for every shelters and 2,30 m of height. Participation : Jesse and Pauline; Luea and Jonas de Arpia; Kimo, Maarten and the families of the camp ' Papaver ' in Kollebleom; Lukas of Kollebloem; the technical services of the village of Herzele, and advice of Ann Hollevoet and Paul Haustraete of the RLVA. During an inauguration step I made the official report that agriculture had not left place to the inhabitants to go through the campaign and to use landscapes of the country of Herzele. Ways even often disappeared. Later they pointed out me to a certain poverty of fauna in this territory. There remain few groves of trees or bushes that can act as shelter and as larder. 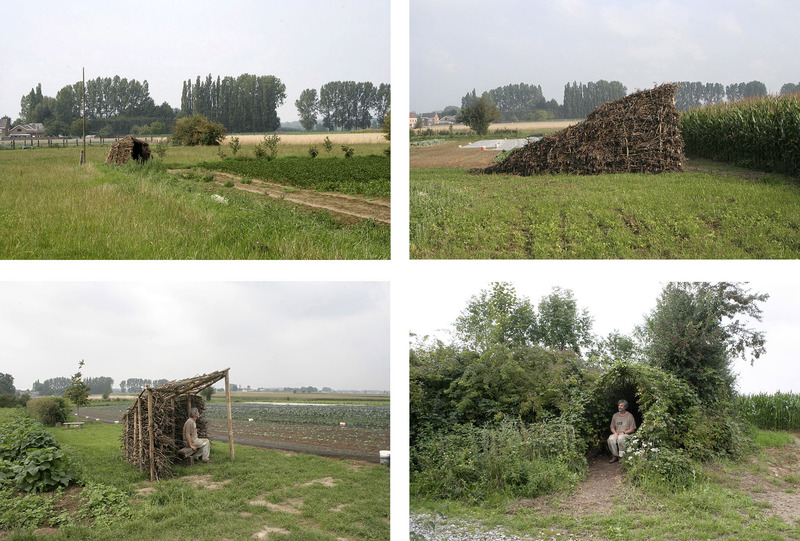 My working hypothesis became simple: they cannot think install shelters coming from the size of trees and bushes of the ambient campaign, it to offer to people who go through this territory of landmarks, stopovers to have a rest and use the landscape. Also, such shelters could not serve also for receiving a local fauna and serving so as intermediary with ambient vegetation by creating green halls, favouring blow its circulation. To construct some of these shelters collectively became a manner of showing that they can give again a place to the inhabitants, to recover the campaign, to live in it while leaving a place to the animal in the world which we indeed share. 1/Always to think of forms of of végétalisation intended for building to supplement them and provide shelter and food to the animals of passage. 2/Always to think of shelters in terms of program and not of completely stopped objects, that is that they are not completely determined in form and number. 3/sites are carefully chosen. Their number is in extensive principle. 4/The materials of shelters come first and foremost from the place where they are established. They come from the territory. These materials are especially materials of recovery. 5/building remains light, exits of fixing things and modes of various assemblages approachable to the biggest number. 6/This building has as principle to provide an interim shelter, they are not aimed at being "habitable " or lasting, they remain temporary, to maintain or to renew. 7/They are always equipped with benches for the stopover, repose for the walkers or the inhabitants of vicinity.